Bring a new lease of life to duck legs! If you’re fed up with basic roasted duck then have a go at this! All the traditional Thai flavours are in this recipe which go well with the richness of the duck and freshens it up. 1. This recipe can be done on the day you want it but prepare the duck the day before if you have the time but it’s delicious either way. Place the duck legs in a bowl and add all of the marinade ingredients in with it. Combine the ingredients well and off you go! Season well and cover before leaving in the fridge overnight or for as long as you can. I have used fresh lime in the marinade to add an acidity however kaffir lime leaves would also work to infuse. 2. When ready to eat, preheat the oven to 180c/ 160 fan and place the duck legs on a baking tray or rack. Cook for around 40 minutes until the duck is cooked through and the juices run clear. Check it halfway and cover loosely with foil if it is getting a bit too golden too quickly. 3. Just before the duck is ready, cook the jasmine rice as per instructions. I like to add in 2 shredded spring onions to add extra flavour. Serve with the duck and scatter over the remaining onion and coriander. You may like to serve some other vegetables on the side such as sugar snap peas or Asian greens- or both! I like to either steam or griddle the greens with a splash of sesame oil to finish; a great accompaniment for a range of dishes! Aromatic Thai duck legs- a sure fire hit! 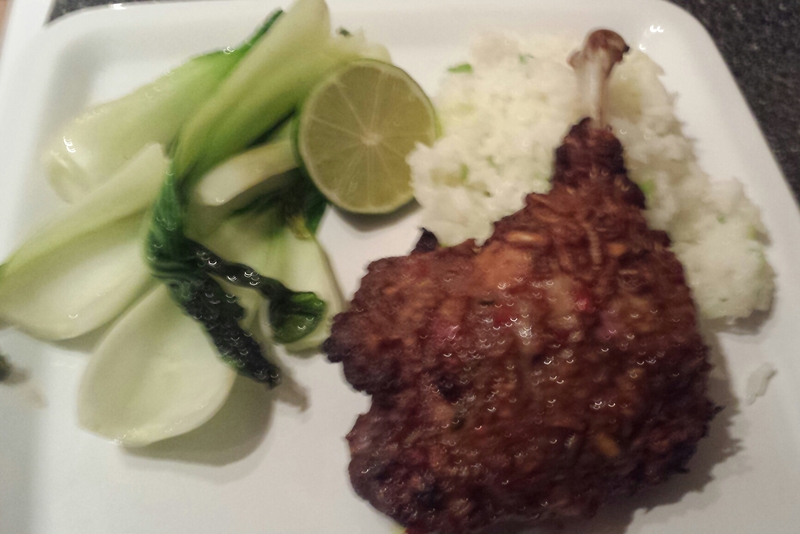 This entry was posted in Recipes and tagged asian, chilli, coriander, cumin, duck, fish sauce, kaffir, lemongrass, pak choi, shallot, Thai by sotiris14. Bookmark the permalink.